The methods used by Google and other search engines to find and rank sites has changed over time. There has been a shift in importance away from meta tags and a rise in the importance placed on content and content description. 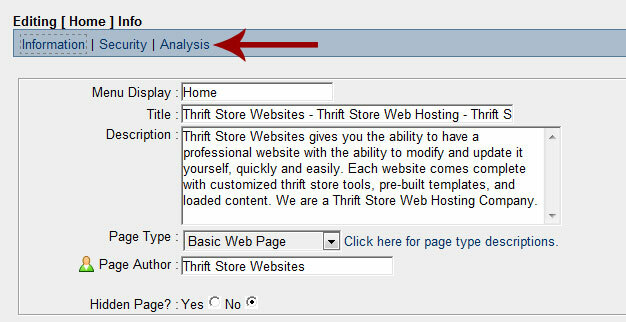 The Thrift Store Websites META Tag analyzer helps users stay on top of these trends by helping coordinate the Web Page Content (especially the Home Page) with likely terms used by the public to search for the web site using a search engine like Google, Yahoo or MSN. We can test how well your page content coordinates with your META description using the analyzer. Start by going to your Edit Menu section. 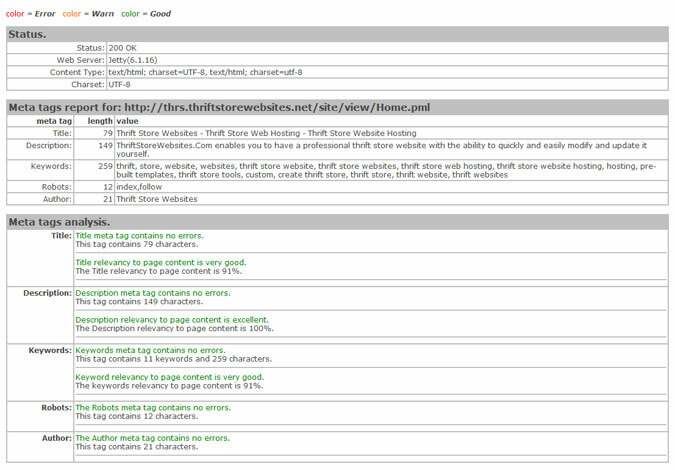 You will see the control specifications for each web page (Page Title, Display Name, Page Type, etc.) as you click on each page on the left. Be sure to fill in the Description field with your practice name and anything else you feel relevant to your page content. You can pick Simple or Detailed, for this example we are going to choose Detailed. The sample report below is from our site where we have done extensive work to coordinate the description to the page content. Real time relevancy will likely vary between 50-90% on average with edits to your Page text to include those key search terms that you expect the public to utilize when searching for your web site. It is vitally important that whatever you reference in the description refers to actual content on your web page. There is alot more information shown in the anylizer, be sure to check it all out and correct any errors. Don't make the mistake of typing up a long and colorful description, but then fail to include any of the same content on the page! Keep in mind this is the first step in working with search engines to assist them in cataloging your site. As always, if you have questions concerns or comments let us know. We are here to help!